The House on Thursday approved a bill to set fiscal 2018 spending levels at agencies across the federal government, rounding out its appropriations work for the coming year. The measure, approved with almost exclusively Republican support, comes just days after President Trump struck a deal with congressional Democrats to fund government at current levels through Dec. 8. The House bill would set funding through Sept. 30, 2018, for agencies related to agriculture; commerce, justice and science; financial services and general government; homeland security; interior; labor, health and human services and education; state and foreign operations; and transportation, housing and urban development. The “octobus” package contains eight of the 12 appropriations bills Congress must pass annually and follows the House’s “minibus,” which the chamber approved in July and included the other four requisite measures. Most of the bills exceed President Trump’s requests for fiscal 2018, but would mark cuts from current spending levels. House lawmakers rejected multiple amendments aimed at cutting various parts of the appropriations package by an additional 10 percent. The Senate, meanwhile, is working to approve its own slate of appropriations bills. Those have generally been more friendly toward agencies than the House versions. The two chambers will have through early December to reach a budget deal that addresses spending caps and sets funding through September of next year. In what would be a victory for federal employees, the House adopted an amendment that would continue to prevent agencies from engaging in a public-private competition to potentially outsource federal work. Lawmakers rejected, however, a proposal to prohibit the Environmental Protection Agency from closing any of its regional offices. The House’s previously passed minibus as currently written would exceed the caps on defense spending established by the 2011 Budget Control Act by $72 billion and would trigger a sequestration of 13.2 percent of funds from all defense accounts. It also would allocate $1.6 billion to the Homeland Security Department to begin construction of a wall along the U.S.-Mexico border, which Democrats have called a non-starter. Trump has said he would allow the government to shut down if Congress did not include funding for the wall. House Speaker Paul Ryan, R-Wis., said the octobus bill “has achieved many conservative victories and top priorities for the Trump administration.” He also noted it was the first time in nearly a decade that the House fulfilled its obligation to pass all 12 appropriations bills before the next fiscal year started. "You know what? 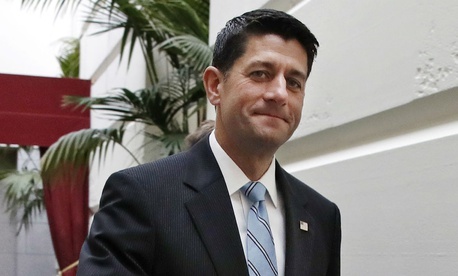 This is a big day," Ryan said at a press conference Thursday. The Trump administration said the president would sign the bill if it were presented to him, though officials voiced some concerns with areas in which Congress proposed more funding than the president requested. The administration also encouraged lawmakers to enact savings it identified in its budget proposal and to adjust spending caps to avoid a sequester.